I have mixed feelings about cauliflower. On one hand, it’s a delicious vegetable that is pretty versatile and goes easy with everything. On the other, it’s become the hot veggie in the no-carb world as everyone tries to turn it into something it’s not: rice, mashed “potatoes”, pizza crust, and even bread. It’s not bread, people! I can get on board with some of it, but I draw the line at trying to turn a vegetable into bread. Go ahead and transform your cauliflower into whatever you want, but I’m going to eat mine as nature intended. Well, if nature intended it to be extra hot and spicy, that is. Yeah, this recipe is hot. It gets a double dose of heat from hot sauce and Sweet Habanero seasoning from Ava Jane’s Kitchen. Let me take a break for a minute and tell you about this seasoning, and all it can do. It’s sweet and spicy, which you may have gotten from the name, but it’s an intense kind of sugar and heat that you won’t get from most spice blends you can pick up at the grocery store. It’s made of two kinds of sugar, and two kinds of heat for a double dose of intensity and a complex flavor you won’t find elsewhere. So you may be wondering why I paired this extra hot spice blend with hot sauce. There’s an easy answer for that: I like hot sauce. 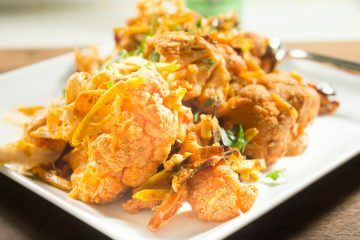 I especially like it on cauliflower (although you won’t find me calling it cauliflower “wings” or something crazy. It’s cauliflower that is coated in hot sauce.) Use whatever your favorite is; I used Frank’s Red Hot. For an extra twist, the roasted, kind of caramelized cauliflower is tossed with crunchy raw cabbage. I find this gives it texture and flavor, to help balance it out, and take your mind off the heat for a minute. Because it is definitely HOT. Serve this with your favorite protein as a healthy side dish. I might also suggest some creamy component like ranch or blue cheese to help tame the heat if that’s your thing. Toss the cauliflower with the avocado oil and Sweet Habanero seasoning. Spread on a baking sheet and roast for 20-25 minutes until cauliflower is soft and lightly caramelized. Put the lime juice, cabbage, and hot sauce in a large bowl. When the cauliflower is done, add it to the bowl and toss until well coated. Sprinkle with Colima Sea Salt and serve immediately.